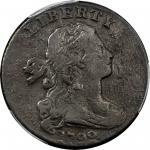 1792 Cent. Without Silver Center. Judd-2, Pollock-2. Rarity-7-. Copper. Reeded Edge. Fine-15 BN (NGC). CAC. 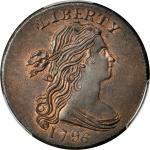 Obv: A bust of Liberty faces right, with flowing hair curls, the legend LIBERTY PARENT OF SCIENCE & INDUST: around the border and the date 1792 tucked in below the truncation, yet above the letters NT and OF in the legend. Rev: An open laurel wreath with fruit on strings and tied with a ribbon with bow surrounds the denomination ONE / CENT. The legend UNITED STATES OF AMERICA is around the border and the denomination 1/100 is below the wreath stems. We are pleased to showcase and offer one of the rarest, most historical, and most important coins in the federal series-the 1792 cent without silver center, traditionally called fusible alloy. Since the Norweb Collection was dispersed in 1988, the only specimens of Judd-2 to sell at public auction are this piece, the recently discovered example whose 2005 auction debut at $437,000 was about what most observers expected at the time, the Lenox Lohr specimen sold in our August 2013 ANA Auction, and the Garrett-Partrick specimen sold by Heritage in January 2015. 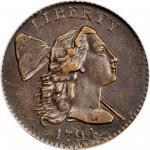 The appearance of this 1792 copper cent is a truly important chance for connoisseurs of American numismatic history to add a prized type to their cabinets. Its rarity and history compare to few issues in the American series, and its connection to our nation's Founding Fathers makes holding it a magnificent way to connect with the cradle days of the United States Mint. This is a highly significant issue from the earliest days of the Philadelphia Mint -- the 1792 pattern cent struck with no silver plug, dating from the last two weeks of December 1792. Nicely detailed surfaces retain strong design elements, just a little soft at the central reverse, although the denomination ONE CENT remains bold. The surfaces are evenly and finely granular, somewhat rougher on the reverse than the obverse but inoffensive on both sides. The fields are a dark brown to charcoal shade, while the design elements, charitably described as having "lighter coppery shades" by a previous cataloger, show an orange-rose tone from an ancient cleaning, perhaps when this piece was recovered. A rim bruise is noted on the obverse at 3 o'clock, dig high on Liberty's forehead at hairline, dig between the letters ST in INDUST on the obverse, a few little scratches behind Liberty's hair and at the base of the wreath, small rim bruise at 12 o'clock on the reverse. The eye appeal is quite nice; it is certainly highly collectible and in actuality finer than all but perhaps the superb example impounded in the Smithsonian Institution, the Norweb specimen with bold EF to AU detail, the Garrett piece that has been certified EF-40 by NGC, and the recently discovered specimen that is currently certified VF-35 by PCGS. "Th. Jefferson has the honor to send the President two cents made on Voigt's plan by putting a silver plug worth 3/4 of a cent into a copper worth 1/4 cent. Mr. Rittenhouse is about to make a few by mixing the same plug by fusion with the same quantity of copper. He will then make of copper alone of the same size & lastly he will make a real cent as ordered by Congress, 4 times as big. Specimens of these several ways of making the cent may now be delivered to the Committee of Congress now having the subject before them." One can only imagine the excitement and questions that arose as some of these first coins were presented to Congress in December of 1792. Which design and type would be chosen? Obviously the silver center cent would require several additional steps to create each planchet, to drill out the center of the copper and place a silver plug of the proper size and weight before striking. How could one determine the proper value of the fusion alloy cent without melting and refining its contents? Straight copper planchets were easiest to produce, but at the size of the present example worth only 1/4 of a cent in metallic value, quite a percentage of seignorage for the Mint to charge. The other design discussed by Jefferson was that of the Birch cents, which were four times as large as this particular coin -- while they offered full value, they also were quite cumbersome. 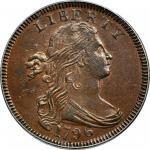 The decision was made to go with the large-size copper cent. 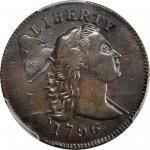 Initially the 1792 Birch patterns weighed 226 grains, but the adopted 1793 Chain cent tips the scale at 208 grains. Producing these smaller copper cents in quantity would have resulted in a distinct profit being made by the Mint, in contrast to the early idea of delivering full weight and measure of intrinsic value. Later circulation strike copper cents were indeed made with copper valued less than the denomination stamped on them, yielding a steady profit at the Mint for generations, providing an income in an era in which silver and gold coins did not do this, for these precious metal coins were produced solely at the request of bullion depositors who were assessed only a small fee for this service. Of the various pattern cents shown to Congress in 1792, the present format might have been the best choice from a financial aspect. 1 - Ex Mint Cabinet; National Numismatic Collection in the Smithsonian Institution, inventory number 1985.0441.1898. Pictured on page 19 of The History of the National Numismatic Collections by Vladimir Clain-Stefanelli. The Adams-Woodin plate coin and the plate coin for Judd's first through seventh editions. Probably the finest known, this is the only example of Judd-2 with smooth surfaces and excellent eye appeal. 2 - Ex Lorin G. Parmelee, purchased for $110 prior to 1886; New York Stamp and Coin's sale of the Lorin G. Parmelee Collection, June 1890, lot 6; Charles Steigerwalt; Dr. Thomas Hall; Virgil Brand, via B. Max Mehl, January 11, 1937; Ambassador and Mrs. R. Henry Norweb, purchased January 11, 1936 via B. Max Mehl; our (Bowers and Merena's) sale of the Norweb Collection, Part III, November 1988, lot 3393; Alan Weinberg Collection. Probably the second finest known, this coin exhibits sharp EF to AU detail. 3 - Ex George Seavey; William Strobridge's Seavey Descriptive Catalog of June 1873, lot 841; Lorin G. Parmelee, who purchased the Seavey Collection intact; Dr. Edward Maris, acquired form Parmelee sometime prior to 1886, as related in correspondence between Harold P. Newlin and T. Harrison Garrett dated June 30, 1886; Harlan P. Smith's sale of the Dr. Edward Maris Collection, June 1886, lot 146; T. Harrison Garrett; Robert and John Work Garrett, by descent, 1888; Robert Garrett interest to John Work Garrett, 1919; transfer completed 1921; John Work Garrett to The Johns Hopkins University, by gift, 1942. our (Bowers and Ruddy's) sale of the Garrett Collection for The Johns Hopkins University, Part IV, March 1981, lot 2348; Donald Groves Partrick; Heritage's sale of the Donald G. Partrick Collection, Part I, January 2015, lot 5503. EF-40 (NGC). This piece is fairly sharp, but with little detail in the central reverse and a Mint-made planchet cutter mark. 4 - Ex Wolcott family, possibly preserved by the family since 1792, surfaced at the 2004 ANA Convention; Anthony Terranova; Ira & Larry Goldberg's Pre-Long Beach Auction of February 2005, lot 806; Donna Levin and Denis Loring, private sale to Heritage; Heritage's sale of the Madison Collection, January 2008, lot 3462; Legend Numismatics; Simpson Collection; Heritage's sale of Selections from the Bob R. Simpson Collection, January 2016, lot 5222; Robert L. Rodriguez. VF-35 (PCGS), CAC. We were fortunate enough to examine this piece carefully when it surfaced at the 2004 ANA Convention; it is a pleasing coin despite some light surface roughness. 5 - Ex William Doyle Galleries' sale of the Loye Lauder Collection, December 1983, lot 234; Dana Linett, 1983; David Henderson; our (Bowers and Merena's) Rare Coin Review No. 53, October 1984; Ira & Larry Goldberg's sale of the Benson Collection, Part I, February 2001, lot 151; our (American Numismatic Rarities') Old West and Franklinton Collections sale, August 2006, lot 14; Southern collection; Simpson Collection, 2007; Laura Sperber; John Albanese; Al Pinkall/Gold Rarities; Heritage's Chicago Signature U.S. 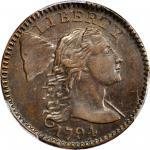 Coin of August 2011, lot 7728; Heritage's FUN Signature Auction of January 2012, lot 3401. Fine-15 BN (NGC), CAC. The present example. 6 - Ex Paramount's Century Sale of April 1965, lot 50; our (Bowers and Ruddy's) Rare Coin Review Nos. 18, 19, and 20; Douglas Robbins, Inc.; Coin World ad, December 4, 1974; Pine Tree Auction's Washington, D.C. Sale, February 1975, lot 59; American Numismatic Association Collection. Good-VG. 7 - Ex Harmer-Rooke, November 1969; William Anton. Jr. Good-VG, rough and porous. 8 - Ex Major Lenox Lohr Collection; Empire Coin Company's Fixed Price List, 1961; our (Bowers and Ruddy's) River Oaks and Krugjohann Collections sale, November 1976, lot 909; our (Stack's) sale of January 1987, lot 476; Dennis Loring; our Chicago ANA Auction of August 2013, lot 4017; Bill Rinehart. Probably also from Thomas Elder's Belknap/Martin Collection sale, October 1908, lot 617. Fine Details--Environmental Damage (PCGS). 9 - Numismatic Gallery's Michael F. Higgy Collection sale, September 1943, lot 1398; F.C.C. Boyd; American Numismatic Society Collection, inventory number 1956.163.25. This specimen reportedly has a plain edge, rather than the usual reeded edge, and the obverse is struck from a shattered die. Some researchers doubt the authenticity of this piece. 10 - Ebenezer Locke Mason's sale of the Fewsmith Cabinet, October 1870, lot 1140; William Sumner Appleton; Massachusetts Historical Society, via Appleton's bequest in 1905, cataloged in that collection in the 1920s but not traced since. The Crosby plate coin, Plate X-22. 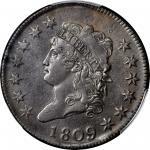 With roughness being a common problem for survivors of this issue, and a flaw on many of the Silver Center cents struck at about the same time in December 1792, we wonder if the copper the Mint acquired is to blame. According to Don Taxay, the Mint advertised in Philadelphia newspapers to buy copper in September and October 1792, and perhaps the copper's poor quality (or the Mint's capacity to roll it properly having not yet been perfected) resulted in this flaw present on all but the Smithsonian Institution specimen. It certainly should not be seen as a detriment today, but rather part of the landscape for these issues. Few examples Judd-2 have shown any silver content under metallurgical testing. Not all have been tested in this manner, however, but of those that have the Harmer-Rooke specimen is a confirmed "fusible alloy" piece, the Garrett and Wolcott specimens have only trace amounts of silver (0.081% and 0.09%, respectively), and the present example is 1% to 1.3% silver per a test conducted by Peter Wright of Alternate Systems, LLC in 2012. It seems likely that the preponderance of specimens of this type are struck on straight copper as opposed to "fusible alloy" planchets; both types would be produced by David Rittenhouse according to Jefferson's letter of December 17, 1792, quoted above. The audience for these patterns appears to be the same as for the Silver Center cents, and the comment in the Annals of Congress that Elias Boudinot had seen "the several samples of coin" by January 1, 1793, indicates that those on the Congressional committee had been given plural examples of the patterns of 1792. That the "fusible alloy," which is really a catch-all term for any alloy, cents would not have looked appreciably different was already understood, and it seems likely to us that production of only a tiny number with silver would have led to the conclusion that such a bimetallic issue was not practical. Since the Norweb Collection was dispersed in 1988, the only specimens of Judd-2 to sell at public auction are this piece, the recently discovered example whose 2005 auction debut at $437,000 was about what most observers expected at the time, the Lenox Lohr specimen sold in our August 2013 ANA Auction, and the Garrett-Partrick specimen sold by Heritage in January 2015. 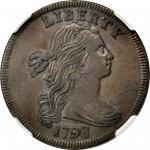 The appearance of this 1792 copper cent is a truly important chance for connoisseurs of American numismatic history to add a prized type to their cabinets. Its rarity and history compare to few issues in the American series, and its connection to our nation's Founding Fathers makes holding it a magnificent way to connect with the cradle days of the United States Mint. PCGS# 11004. NGC ID: 2949. Provenance: From the William Doyle Galleries' sale of the Loye Lauder Collection, December 1983, lot 234; Dana Linett, 1983; David Henderson; our (Bowers and Merena's) Rare Coin Review No. 53, October 1984; Ira & Larry Goldberg's sale of the Benson Collection, Part I, February 2001, lot 151; our (American Numismatic Rarities') Old West and Franklinton Collections sale, August 2006, lot 14; Southern collection; Simpson Collection; Laura Sperber; John Albanese; Al Pinkall/Gold Rarities; Heritage's Chicago Signature U.S. 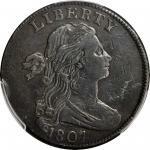 Coin of August 2011, lot 7728; Heritage's FUN Signature Auction of January 2012, lot 3401.